Hyderabad, the city of pearls is not just famous for the pearls and historical landmarks. It is also famous for the tastiest food options available. It isn’t any exaggeration to say the name Hyderabad instantly reminds us of Biryani and Kebabs. There are many great restaurants that serve ultimate food in our city. Today we wanted to bring you something different, so we brought you the best restaurants in Hyderabad for couples near Sky Zone. Being in a relationship myself, I know how much searching couples do to find great places to hangout and have good food. So, here I am with the article “best restaurants in Hyderabad for couples near Sky Zone” to give you few valuable options and make your troubles go away. Sky Zone Hyderabad is located in Gandipet, which is 20kms away from the main city. So, my list will contain good restaurants around it, that will make your day a great one. Located very near to Sky Zone indoor trampoline park, Jewel of Nizam – The Minar is a luxury dining place sitting up high in the air on a tower. A very peaceful, secluded place with royal ambience and mesmerizing views. Book a table and surprise your loved ones. Trust me, this place will be one of the best restaurants in Hyderabad you could ever visit with your soul mate. Don’t judge the place by its name. Though the name suggests Sandwiches, they serve multiple cuisines here which includes Indian, Chinese, Continental & Italian. Whether you are planning for a quickbite or a leisure lunch/dinner with your mate, this is an ideal place to spend time as there won’t be any disturbances and restrictions. 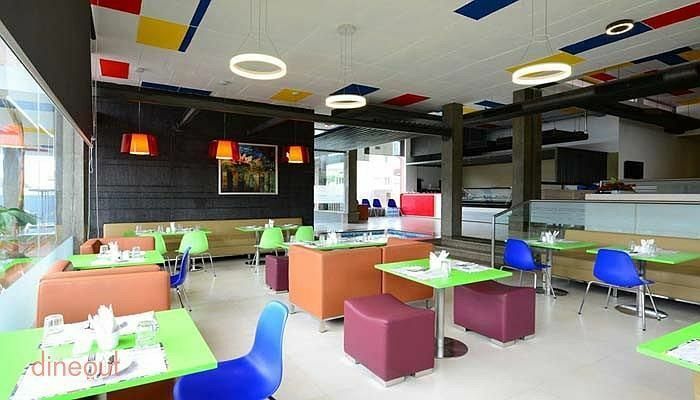 Unlike the other two places, Sky Lounge Hyderabad is a drive inn located in the vicinity of Sky Zone Hyderabad. It has five different restaurants serving various cuisines. While restaurants like Genuine Broaster Chicken, Food Whale, IndiZone and Sky Dragon serve your food cravings with delicious food, the famous Makers of Milkshakes will serve your thirst with tasty shakes. The biggest advantage of choosing this restaurant is, you don’t have to travel anywhere else if you want to have some fun after eating food. Sky Zone is right beside the restaurant and there is also Sky Golf to play. It is already known that Sky Zone Hyderabad is one of the largest trampoline parks in India and it is considered as one of the best places to visit near Hyderabad within 100 kms.